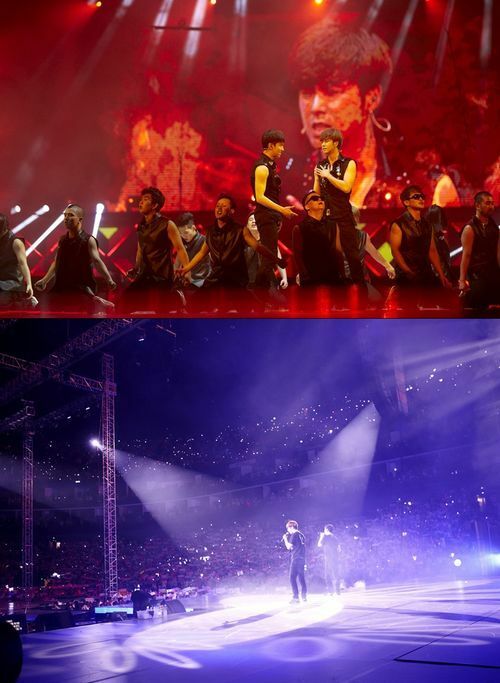 On their world tour, TVXQ have performed in LA, USA, Santiago, Chile, and now Shanghai, China. TVXQ held their ‘TVXQ! LIVE WORLD TOUR ‘CATCH ME’ in SHANGHAI’ concert at 7:30pm at the Mercedes-Benz Arena in Shanghai, China. They captivated 10,000 fans with an amazing performance and great stage sets. On this day, TVXQ performed a total of 25 songs, including hits like ‘Catch Me’, ‘Humanoids’, ‘Rising’, Why? Keep Your Head Down’, and ‘Mirotic’, as well as solo performances by U-Know Yunho and Max Changmin of ‘Honey Funny Bunny’ and the Chinese ballad ‘Ting Hai (聽海)’ respectively. Fans in the audience held pearl-red fanlights and sang along in Korean, enjoying the performance to the fullest and even prepared a paper slogan event that said ‘TVXQ! Let’s Fly’, touching TVXQ and making the atmosphere of the concert better than ever. There was fierce competition at the arena to grab last-minute tickets on the day of the concerts, and countless fans flocked to the area to take their chance. As they rushed towards the entry gate, the door at the gate broke, requiring the presence of public safety officials to sort things out. Meanwhile, TVXQ have now successfully completed their Shanghai performance and are set to become the first non-Japanese singers to perform at Japan’s Nissan Stadium on the 17th and 18th of August. These two performances will conclude their large-scale Japanese tour that is expected to attract a total of 850,000 people.